* code #5 - removes excess WordPress header tags from default themes. * feel free to customize the options to suit your own needs. There’s more of it in this collection. WordPress 3.0 Just Around the Corner! With yesterday’s announcement of the first release candidate for WordPress 3.0, it is almost certain that we will be blogging with a new WP version in a matter of days. Since this is a major release, be sure to check for compatibility especially if you run more than a handful of plugins. Overall, we see use of dynamic languages as growing significantly. This is due to several large trends. 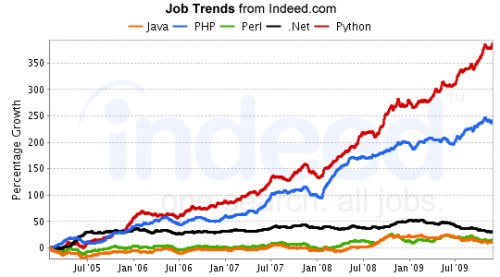 First, there’s definitely a widespread growth of skills around open source programming languages. There’s also a widespread acceptance of open source in the enterprise that didn’t exist even five to six years ago. And there are various respective inherent advantages of using dynamic languages–speed, flexibility, ease of use for developers, low-cost, and community support, just to name a few–that continue to push usage trends upward. Now this is perfectly good news for the open source community! timthumb: A small php script for cropping, zooming and resizing web images (jpg, png, gif). PHP Simple HTML DOM Parser: An HTML DOM parser written in PHP5+ let you manipulate HTML in a very easy way! sevenup: Encourage the world to get rid of IE6! gooseGrade: Allow your readers to become citizen editors. gooseGrade is a free service that allows your readers to post spelling, grammar, factual, and other errors straight to you. ProFolio: An elegantly designed portfolio for artists, designers, photographers, or anyone that has creative visual pieces to share! Galleriffic, a jQuery plugin for rendering fast-performing photo galleries. Planning to create your first Facebook application? This PHP class would be very useful. Flourish is an object-oriented PHP 5 library designed to reduce code and improve security. It’s not an MVC framework and it doesn’t try to solve every problem. Instead, it focuses on being small, portable, well documented and easy to use. For those who just started playing with PHP programming and would like to try their skills without spending on a paid hosting service, here’s five providers that serve PHP pages for free! I’m sure that like a lot of bloggers out there, you’re using WordPress to power your blogs. And because WordPress is now the de facto choice for self–hosted blogging apps, it is now a favorite target for various security attacks. It’s like every ill–willed hacker is busy trying to find vulnerabilities in it. Upgrade the application as often as there are new versions. This includes even point releases that may seem unnecessary, updates are there for a reason. Download only from wordpress.org. This becomes even more important if you can hardly understand code. Get your updates from legitimate sources only. Only use trustworthy themes and plugins. Now this is not exactly easy, but knowing where to get them is half the battle. Always start your search from WordPress Extend and reliable third–party sources like WTC. Update your plugins. And themes too. As everyone tries to make WordPress useful to others, some tend to release not–too–ready code. Some of these introduce vulnerabilities, but are typically updated prompty. Don’t forget to upgrade. Deactivate unused plugins and delete them. Unused plugins do nothing, and they just increase the load WordPress puts on your server processes. The less plugins, the better. And make sure you delete them, even deactivated plugins can be executed without you knowing it! Now those are just some tips to keep in mind. If you have other reminders for fellow WordPress users, share them by leaving a comment. pChart is a PHP library that will help put nice graphical charts in your applications. And the best thing about pChart is that it’s free unlike other similar solutions. Another advantage is the quality of the generated graphs that puts non–free solutions to shame. I’m sure this will come in handy for future PHP projects. WordPress 2.6 is almost here with the availability of Release Candidate 1, so if you’re a plugin writer you might need to see some changes on how plugins behave in the new version. Working with PHP’s $_GET, $_POST, and $_COOKIE can be daunting especially when dealing with various magic quotes configuration, etc. More importantly, these superglobals are also subject to SQL injections and other hack attacks. Good thing there’s Inspekt — a PHP class that puts these variables in a “cage” and sanitizes them. Accessing the specific variables that you need is done through specified methods, returning safer values, containing only what you need. If you’ve got more to share, leave a comment to us know. Are you writing your first WordPress plugin? One way of the best ways to learn how is to read other plugins’ code; most of which you need to do has probably been written by someone else before. You can also use this code generator that produces a template for your WordPress plugin, which you can fill with your code and distribute to the community. But why would you want to write a WordPress plugin? There are enough reasons to get you started, not to mention that it’s fun and quite easy to do with all the resources available. Zend Framework 1.0 now available! Claiming to be the best suited PHP5 framework for meeting business needs, ZF should make significant headway into widespread use considering it can leverage its direct link to PHP itself, similarly a product attributed to Zend itself. The question though is will ZF be able to eat into the Ruby on Rails crowd? If you’re a fan of Ruby on Rails’ scaffolding feature, you’ll be surprised that the same thing can be achieved in PHP. In their 15 minute weblog instuctional movie, this feature is used and shows how development time is greatly reduced by dynamic generation of a pseudo–CMS for managing your applications database tables. Now here’s a PHP class that enables us to do the same, where we can list, add, edit, and delete table rows for all our database tables. Of course we can do it with PHPMyAdmin, but here’s another option for rapid prototyping in our web applications. Now if only someone would extend this to accommodate foreign keys and other table–to–table restrictions. For now, here’s our little PHP Scaffolding class. I’m sure you’ve seen little [+] icons at the bottom of popular webpages. These things are feedback mechanisms powered by OpinionLab, a service that aims to rate a page’s usefulness. Now it would be nice if we had something like it for our little sites, right? WordPress is really the “in thing” nowadays that even old school favorite webmonkey has a site building article using the popular blogging software. Theme installation and customization is pretty much covered along with a brief intro on WordPress plugins, nifty little extensions that could make or break (literally!) your site. This new article almost coincides with the recent release of WordPress 2.0.3 which addresses several bugs and important security concerns. If you’re running the WP2 codebase on your site, be sure to get this maintenance release. Every web 2.0 builder is most likely exposed to comment spam because of the social nature of this generation’s web applications. This requires considerable effort in building a system that is not easily gamed by spammers, to avoid it being rendered useless by nonsense content. Aside from email, comment spam is the next most prevalent form of spamming. This is largely because of the nature how google ranks pages through its PageRank algorithm. Automattic’s Akismet has been one good weapon against comment spam since its inception as WordPress’s spam blocking mechanism. Thanks to its useful API, you can now use Akismet to check your comments against their spam–fighting magic from any PHP4–based system, using this PHP class from Pablotron.org.